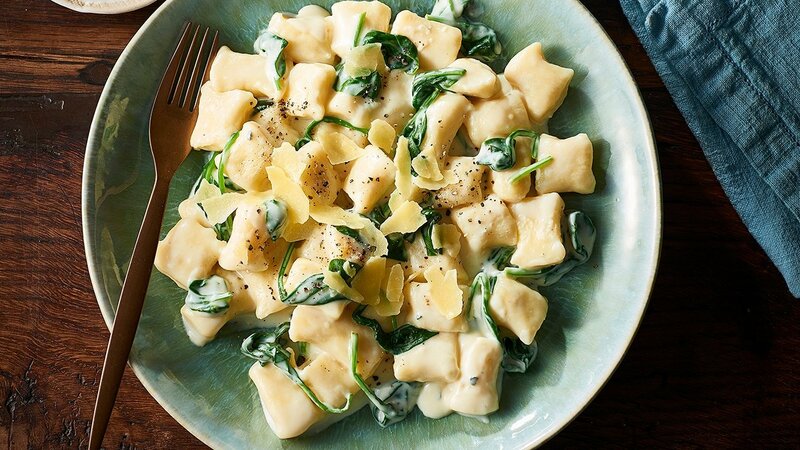 The gnocchi's light pillowy texture and mild flavour makes them perfect for rich hearty blue cheese sauce. In a pot - bring water to the boil. Once boiling add in the salt and remove from heat. Pour in the milk before whisking in the KNORR Potato Flakes GF. Whisk until combined. Sit for two minutes and then whisk again. In a small bowl whisk the eggs salt and pepper together. Once the mash is cooled, add in the egg mix followed by the sifted flour. Blend in enough flour to make a stiff dough. Turn dough out on a well-floured work surface and knead lightly. Divide dough in half. Shape each half into a long thin roll about 1.5cm thickness. With a knife dipped in flour, cut into bite-size pieces. Cook gnocchi until desired in boiling salted water. To make blue cheese sauce, place milk into saucepan. On medium heat bring to boil. Once boiled remove from heat and whisk in KNORR Roux. Continue to whisk until thick and smooth. Add in the blue cheese. Mascarpone, half the parmesan and spinach. Toss the cooked gnocchi through the sauce. Garnish with parmesan.